We recently became Aircall’s official partner providing customers an integrated solution for lead management and VoIP software. Since then, we’ve been receiving tons of requests on how our integration works and how it impacts sales teams’ performances. This article serves to breakdown 3 ways to improve sales using Aircall together with noCRM. In most cases, outbound sales is a numbers game. That doesn’t mean that your sales reps should be sending non-personalized emails or making uneducated calls. However, having tools that allow you to boost those numbers is also key. noCRM’s Prospecting Lists allow you to upload your unqualified contact lists so you can process them before adding them into your clean sales pipeline. You can sift through each prospect efficiently using the Prospect Browser. That means significantly improving the speed of which you can call prospects by clicking on one button to move to the next contact. The Prospect Browser also allows you to instantaneously detect any duplicates, launch LinkedIn or Google searches, and add any vital details to the prospect’s summary section. Once you have a researched list of your prospects, you can begin calling each one to start the qualification process. Enter Aircall. Their integrated softphone allows you to dial prospects directly from your noCRM account and records each conversation. Once you’re done with your call, noCRM retrieves the recording and adds it to the prospect card so you don’t waste any time with manual entry. One of the ways to improve sales conversions is by engaging with leads in conversations that actually add value. There’s nothing worse than jumping on a call with a potential customer and not knowing where you last left off. Continuity is important to keep your leads engaged. Sales reps must know the historical exchanges that happened with the lead, what the last conversation or meeting was about and how to go from there in order to increase marginal gains. With noCRM’s lead cards, it’s pretty much like adding and viewing comments on any social media platform– It’s fast to enter information and easy to track previous exchanges. As sales reps have quick access to the historicals, they can continue to build valuable contact with their leads. 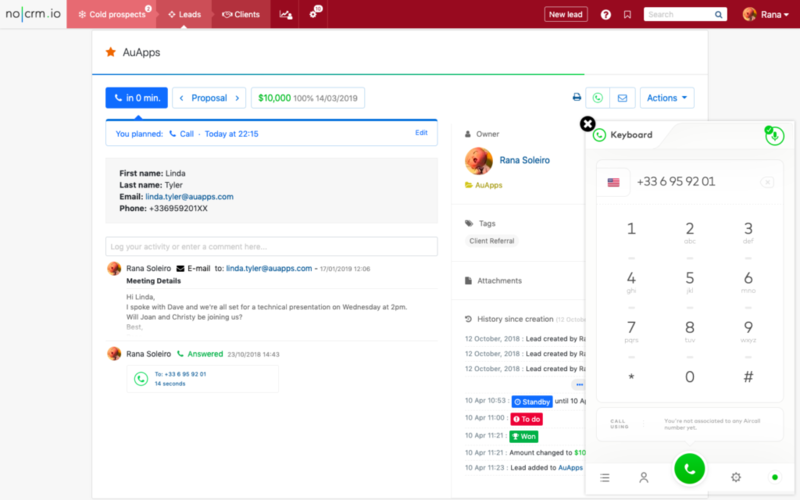 Our integration with Aircall further supports reps by allowing them to call your leads in one click from within noCRM, view previous notes for reference and enter call details directly on the lead while they’re at it. Once the call is complete, the recording, duration, and number dialed are made automatically available on the lead. Sales training is not only important when onboarding new comers, but also to consistently improve your entire sales team. For new comers, it’s essential for managers to be present on the first few calls. This is to ensure the quality of their pitch, presentation, and communication skills. Aircall’s Live Feed feature gives managers the option to join a live call as an announced guest or incognito. Using the incognito mode, managers can jump on a rep’s call without the added stress. Should their schedules not match, managers can playback any call from noCRM and better coach their reps through identified hurdles. Consistent coaching is essential to maintain and increase sales teams’ success. noCRM’s custom activities and outcomes provide concrete metrics on how many successful calls were made, by who as well as information on lost leads. This data enables sales managers to narrow down those leads and figure out what happened. Once they have all the information needed, they can work towards the winning formula and resolve common challenges in the sales process. Together with Aircall, we offer a strong integrated solution that has proven to help businesses grow. For more ways to improve sales, check out our blog for more tips and tricks!